Join us at this year's Travel Fest for inspiring photos & stories shared by travel experts. Listen to our speakers and decide for yourself: Which adventure makes your heart beat faster? That's the one to aim for in 2019. PLUS: Hidden gems "in your backyard" in SE Asia that you may never have heard of -- great for long weekend outings. PLUS: Short expert talks such as "how to pack lightly for your trip", and "what to wear (and not to wear) on a hiking trip". 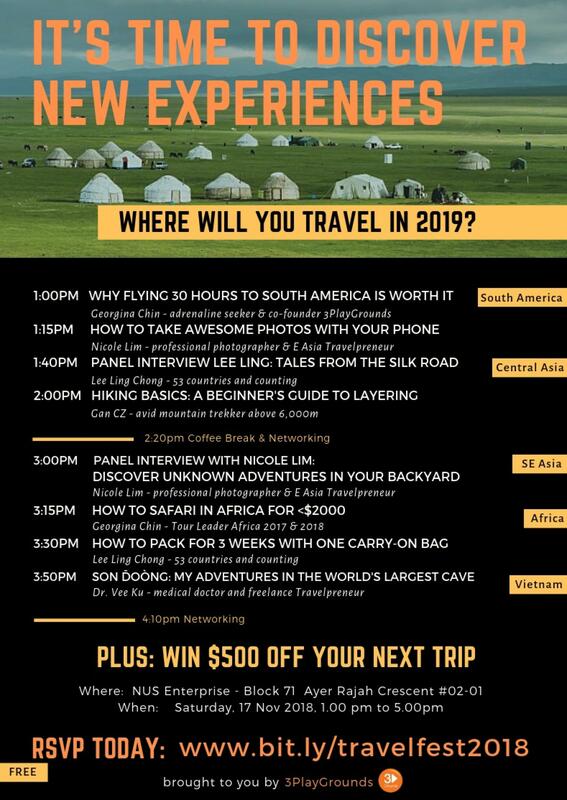 LUCKY DRAW -- EACH ATTENDEE STANDS A CHANCE TO WIN: $500 OFF YOUR NEXT TRIP | TRAVEL GADGETS | A SURFING TRIP TO MALAYSIA. 3PlayGrounds would like to thank NUS Enterprise for being a venue partner for this event.